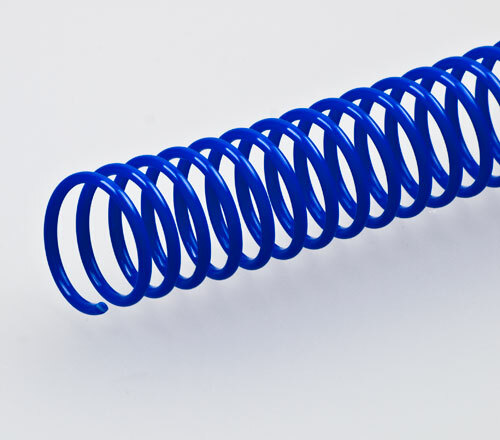 Spiral binding is often called Coil Binding, Plastic Coil, Plastikoil or EZ Coil. We stock a large range of spiral binding supplies in several colours and diameters up to 28mm. Using a spiral coil binding machine you can add energy and colour to any business document. Your pages can rotate 360 degrees allowing the document to be folded back on itself or opened flat. Plastic spirals are virtually indestructible making it a perfect solution if the documents are intended for mailing. Other colours are available on request. Coils can be supplied in 4:1 or 6mm pitch, please make sure you have selected the right product. Other colours available on request. Spirals are available in 4:1 pitch. 6mm pitch spirals are also available online. Please ensure you have chosen the right product.